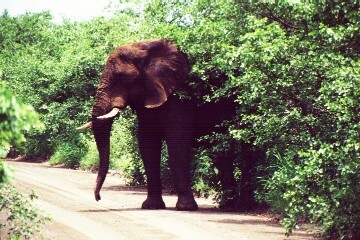 Kruger Park is amazing for its animal life and its camping facilities. 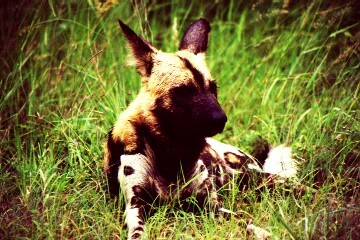 They have wild dog too! A great highlight has to be the Drakensberg Mountains which are truly spectacular and deserve at least a week of your time. Rhodes is a special place. It is like stepping back into England a hundred years ago. We crossed the Beitbridge border at the dreaded 4 o'clock but all was fine this time. After stocking up on a few provisions we headed off to the Messina campsite yet again and its swimming pool. Andrew spent some time working on the car because the air-con had packed up. What a disaster - but it wasn't for long. James and I had a swim under the setting sun. After a steak braai we were all back in the pool but James wimped out on skinny dipping! I tried twice that evening to pay for the camping but the chap was busy and I was told to return later. At 6am the following morning we were woken by the pesky chap wanting his cash. He could have had the decency to wait until we were up but in true African style he smiled, nodded and said 'yes' when we asked him if he realised he'd woken us all up. Agh, you just want to shake these people sometimes. So we had an early start and reached the Pafuri gate in the north of Kruger National Park by 10am for a few days of animal viewing. The northern section of the park is quite dense and the animal viewing opportunities of the day were restricted to impala, warthog (I love them) and a lesser spotted eagle (we think). After an obligatory excursion to take Punda to the Punda Maria Camp we finally settled at Shingwetzi which has the most delightful swimming pool imaginable. That evening it was so hot and humid (90%) that we all had to cool off in the pool before going to bed. After a day we had only got a quarter of the way through the park so in the morning we made plans to put on a bit of a spurt. However there were loads of animal to be seen and we ended up driving around very slowly indeed to avoid elephant in the road and to observe grand herds of elephant, wildebeest, impala, hippos and giraffe. When we designed Punda we put a viewing hole in the roofrack above the rear sunroof so we could stand in the back of the car and have our heads poking through the top. Today was the first time we had used it and it was fantastic. From this higher vantage point you could see much more and it was a great spot from which to take photos and video. The tan benefited too! At Olifants Camp we booked our place at Balule bush camp for that night but by the time we left Olifants the gates were closed. We had to beg to be let out of the camp. Fortunately there is no camping at Olifants so they had to let us go as they had no where to put us up. The half hour trip to Balule was a bit of a dash but we were able to see nyala for the first time along with herds of waterbuck. Balule is supposedly a rough camp but we found it to be really pleasant. There is no electricity but they have running water and good ablutions so we scored it highly on our luxury scale. The bugs, however, were dreadful and we escaped some of them by putting up the giant mozzi net under the awning. Whilst cooking dinner we heard a grunt and expected to see warthog on the other side of the fence next to which we had parked. 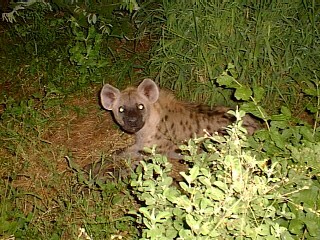 The torch revealed two very large hyena. We could hardly contain our excitement. It was so strange because they looked so timid and cuddly yet these were wild animals and would take your arm off if they could. They just lay down in the grass, probably waiting for a scrap of our satay chicken. A very long wait indeed. They got nowt. The morning was really hot and humid but by the time we were packed up it was raining. The sky regularly exploded with lightening displays, one so close that we watched the lightening fizzle out in circular patterns. As the temperature was somewhat lower than usual due to the rain the animals were out and we were able to spy a couple of lions. Herds of impala were everywhere but the highlight of the day was the pack of wild dog. These are rare creatures (2000 in total worldwide - less than white rhino) and we came across five playing by the side of the road. What a treat. We parked up and watched them for half an hour. Nothing was going to beat this sight so we decided it was time to exit the park and push on to the Drakensberg. It takes a long time to go a very short distance in this country and we didn't make it far out of the park that evening. As we were passing through HazyView we decided to drop into the Kruger Park Backpackers (KPB) which is owned by our friend Iain who we met in Cape Town a few months ago. 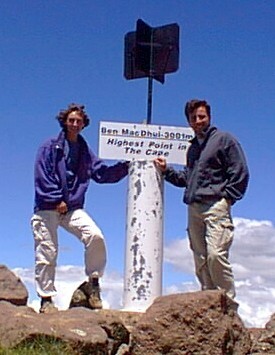 What a surprise we got when we arrived - Graham was there too, having recently left Aardvark Backpackers. Apparently Sally and Noel had been staying at KPB until last week and were now on their way to Mozambique via Swaziland. KPB made us very welcome indeed. After beers, a few games of pool, dinner and Laurence of Arabia on the t.v. we all retired and tried to sleep to the sounds of frog mating calls and bats beeping. The following morning we left KPB to go to the Drakensberg. By the time we reached the Cathedral Peak Reserve it was dark and we were unable to appreciate the views. We set up camp in the site which has no electricity but has running water and had a very comfortable and cool nights sleep - without the bats. 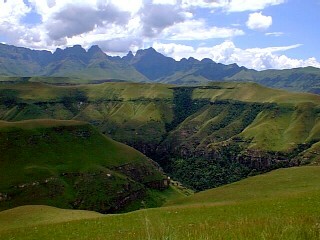 The Drakensberg is a most fantastic mountain range - majestic and imposing but highly inviting. Gordon had suggested we climb Cathedral Peak but Andrews back was playing up so we drove up Mikes Pass and set up the car for a day of relaxation amongst these beautiful mountains. The weather was lovely and stayed that way for the entire day - a rare treat we understand. The day wasn't much fun for Andrew who spent most of it on his back in the rear of the car. On Tuesday 11th we decided to make our way to the beach. We would have stayed longer in the mountains had Andrews back been up to it but we thought a few days at the beach would be more appropriate. After all, James had to return to the UK with a tan! The journey to Durban through the KwaZulu Natal (KZN) region was short and beautiful. Vast open spaces of greenery, valleys and hills galore. The weather was fine until we reached Ballito just north of Durban when everything became grey. Ballito is a quiet resort - this explains why the campsite (Dolphin Caravan Park) has loads of facilities. It makes up for what the town lacks. The guide books seem to think it is a happening place but we couldn't find where it was all happening. We spent the remainder of the afternoon by the car reading newspapers and scoffing so many nibbles that Andrew couldn't eat his dinner. We had come to the beach to do some swimming in the Indian Ocean but the next morning greeted us with cold (25°C) windy weather. We took a walk along the beach and dipped our toes. It wasn't as warm as expected and certainly not as blue. More of a brown due to muddy river water joining the sea! The ice cream shop was shut too! Feeling sorry for ourselves we fought the wind and returned to the car. Andrew spent the rest of the afternoon lying down while James and I spent the afternoon on a very serious job - catching up with important gossip at the local cybercafe. 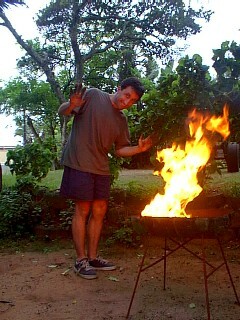 That night we had a braai in the rain. Surprise - it was still raining the next day. Despite the rain I was under the car fixing it. Fortunately it was only a loose nut which was causing the exhaust to vibrate a little. The coastline around Durban is notorious for its sharks which come in their thousands each year when travelling between Cape Town and Mozambique. Most of the worlds research into sharks is done in both Australia and Durban, the latter at the Natal Sharks Board which we decided to visit. It was reasonably informative but because we were already interested in sharks from our scuba diving activities and have a few National Geographic videos it wasn't the educational experience we had hoped for. Following the shark video (more like an advert for the Sharks Board) a black tip reef shark was cut up for our benefit. Each day sharks get caught up in the nets surrounding the beach and are used in the dissection demonstrations. The dissection could have been really interesting and I was itching to get some gloves on and get in there but not a lot happened. The liver, heart and stomach were removed and the end of the nose cut off. There is a gel in the end of the nose which is sensitive to electrical activity and is so sensitive it can even detect the electrical activity of our muscles. This is how they sense the presence of potential prey. The beaches around Durban are protected by shark nets which have drastically cut down the number of shark attacks in recent years. We were surprised to discover that the nets are only 10-15 metres in length and that a gap exists between them and the seabed. This allows the ocean life to travel into shallow water for feeding purposes. As this happens mainly at night - keep out of the water. The rare shark attacks which occur are mainly at night when unwary people go for a swim at the time when the sharks are feeding. After the demonstration we met up with Karen who is a friend of James. She took us back to Rhoda and Kevins house which was to be our home for the next two nights. That evening we sampled the culinary delights of Durban at a very good pizza place. Andrews back was starting to feel a little better but I developed a stiff neck. What a couple of geriatrics! We were up very early in the morning (6.30am - agh) as Rhoda was cooking us breakfast and so we could spend a little time with Karen and Kevin before they left for work. Rhoda and Kevin have two children - Joshua who is almost three and Emma who is five months. We all learned what hard work it is looking after children as we tried to entertain them for the morning. That afternoon we went to the beach where we sat in the car and nodded off to recuperate. Durban is very much like Abidjan in the Cote d'Ivoire. It is modern, has wide roads and has parks in the middle of town. I was disappointed not to see Banco washermen doing their washing by the roadside though! It was James last night and we met up with Karen and her mates for drinkies but sadly us geriatrics were not physically up to the proposed clubbing. Saturday 15th was the day of James departure. Three weeks had gone by so quickly and we were all feeling sad. The rain reflected our mood as the mornings activities were conducted at half speed in the hope of slowing down time. It was dreadful watching him go through the departure gate and the rain poured as we stood on top of the landy waving off his aircraft as it disappeared into the clouds. It was time to shift ourselves but we had no plans where to go or what to do next so we headed south in the rain. At Uvongo we found a campsite where we ended up staying for a couple of days. Both of us weren't feeling too well and found that we couldn't do more than ten minutes of activity without having to lie down for five minutes. The rain continued to pour and the radio reported mass floods in the KZN area. So much for this area being called the "sunshine coast". River banks were breaking and roads were being washed away. Here we were sick in a disaster area. James had returned home safely after not a very good flight. He wasn't well either and left his mark on South Africa by barfing on the tarmac at Cape Town International Airport! The rain continued in KZN but ironically CapeTown was suffering its seasonal dose of fires caused by the January heat and exacerbated by the strong winds known as the "Cape Doctor". Hout Bay and the Cape Peninsular were being affected and we feared for the homes of our friends. On Monday 17th we emerged from the tent feeling very lethargic but determined to move on. It took us a few hours to pack the tent away and by then the rain had stopped - hurray. The sun came out briefly and we managed to spend a couple of hours on the beach laughing at the locals and their attempts to put up parasols and windbreaks and fighting with their partners over whose turn it was to watch the children while the other had a lie in the sun. We drove through Margate and Ramsgate and they were just like their English equivalents - ice cream shops, chippies, socks on the beach and tacky souvenirs. We stopped off for a "bunny chow" (thanks for the recommendation, Rhoda) which are bread loaves with the inside scooped out and then filled with a stew of some sort. Absolutely delicious and we ate heartily totally disregarding the inevitable consequence. This is a KZN favourite and in my opinion is South Africas equivalent of the shwarma of West Africa (S.A. shwarmas are not good). Further south we were surrounded with tropical vegetation and banana plantations galore. What a lush area. This is where the rich come to retire and play golf on the manicured courses and have huge homes overlooking the beach. The very pleasant Paradise Resort was our campsite for the night before heading off into the sun in the morning. At last! We didn't travel very far that day as we visited the Space Centre at Port Edward. The centre is set up mainly for childrens groups for teachings on stars and planets. However there is a very interesting museum and telescope and Graham, the owner, enjoys a good chat about planetary theories and anything to do with space. I went to bed at 4pm feeling ill while Andrew and Graham nattered for the next nine hours. The stories are quite fascinating! Crossing the Mtamvuna River south of Port Edward takes you into the Eastern Cape Province which contains the former homeland of the Transkei. Immediately the landscape changes, as do the road conditions. Transkei roads are notoriously bad, particularly after rain. We left behind the plantations as green rolling hills, valleys and beautiful circular homes took priority. There were local children walking everywhere and in different directions. I don't know what happens about schooling here but the children wear uniforms but seem to be outside all day walking about. 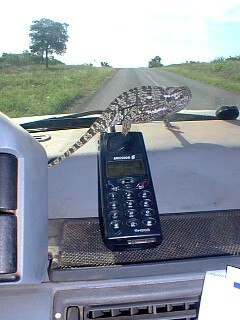 Following the road to Mkambati was a little like following roads in West Africa - pure guesswork to start with. Eventually there were signs but the road conditions, made worse by the recent floods meant that the short journey took practically all day. The Mkambati Nature Reserve was recommended to us by the receptionist at the Dolphin Caravan Park in Ballito so we were surprised to find out that there was no camping allowed at the park. We had to hire a rondavel on the beach. It sounded pleasant but the wind was blowing a hooly, the rondavels have no electricity (not a problem when we are in Punda but tonight we were to have a candle) and the furniture was more inferior than in student digs. Oh well, the loo which was about 3m away from the bed was very welcome as the bad bottom continued with a vengeance. West Africa gut rot had nothing on this. After moving practically half the car into the rondavel we went for a brief walk along the beach to play with the crabs. In fact, Andrew dug them up and teased them. They have windscreen wiper type things to clear the sand away from their eyes which were fascinating to watch. In the morning Andrews back was still not good but I was feeling a little better. 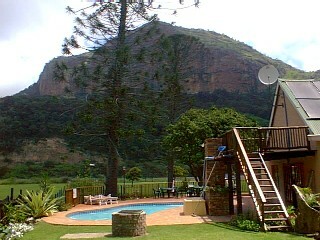 We had to move out of the rondavel as it was booked for that night and move into one of the bungalows. A far better option as the facilities were great and the less optimum location was of no consequence to us. 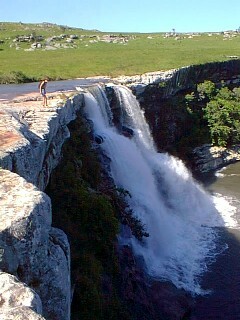 A day of sightseeing was in order so we went off on a drive to the river and its numerous waterfalls. The road was tricky in parts and saw me doing some very careful driving indeed. This was actually a very large hole which I straddled with half a tyre on each side of the hole. There was an easier route but this one was more fun. The afternoon was spent walking along the riverside passing the assortment of waterfalls. Regular rests were necessary as we were both feeling 50% so a bit of sunbathing was the order of the day. The park here is very different to all the others we have been to. 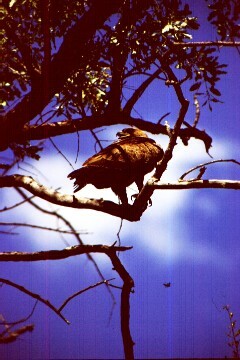 There are no predators so it is safe to go on independent walkabouts. There is also not a great deal of life but the zebra, wildebeest and blesbok herds we spied are probably the safest in the country. However, they were quite twitchy and the only way we could get close to them was to pretend to be a pantomime horse. As Andrews back was playing up I was the back end! That night I'd had enough of feeling sick so I dipped into the supply of antibiotics we had brought from the UK and hoped that they would take effect quickly. 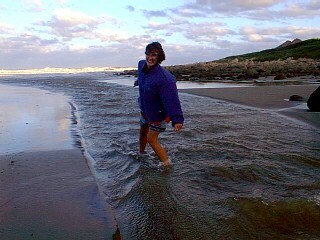 The next morning we decided to move on to Port St Johns to find somewhere by the beach to recuperate for a few days. The guide books describe the town as "deliciously backward" which is an accurate description. In fact, it is the marijuana capital of the south. The Cremorne Estate (www.cremorne.co.za) set beside the Mzimvubu River was the first place we came across and was so tranquil we decided to stay. A quick excursion to town to stock up on essentials of the food kind was necessary before setting up camp and staying put for a while. A visit to Dr O'Mahoneys surgery confirmed that I was using the right antibiotics and also provided an opportunity to get some alternatives if the ones I was taking failed to work. The next few days at Cremorne were lovely. The pool, mountain views, restaurant and t.v. meant that we could sit around and do as little as we wanted. The antibiotics started to kick in and at last I could eat more than three mouthfuls without feeling full and exhausted. After a week of 200 calories per day I was feeling really weak but the Cremorne food and Andrews cooking got me up and about again. Andrews back started to feel better and we delighted in watching some films on the t.v. You don't crave the television when it's not there but you really appreciate it when you get to watch something really entertaining. By Sunday 23rd we were both feeling much better. The sun was shining so I spent the morning by the pool but ended up looking like a patchy lobster. My fault for not putting the factor 15 on soon enough. A proper Sunday roast was on offer but as the appetite wasn't up to much we had the meal staggered - some for lunch then some at dinner time. The staff here are very flexible and run a very friendly centre. On Monday I wasn't feeling too well again so we had a slow day of sleeping and watching some terrible films on the t.v. Tuesday was not a good day either and I decided to swap the antibiotics as a self diagnosis of giardiasis seemed most appropriate. Goodness knows where I got it from though - possibly the Zambezi. Wednesday was terrible and I was getting really cheesed off with feeling sick all the time. Bad botty was not too bad but constantly feeling nauseous was really wearing. By Thursday afternoon I was feeling much better and we took a drive up to the airfield for the spectacular views of the coastline. Passing a group of naked hippies we made our way up the twisting roads to the top of the gorge. 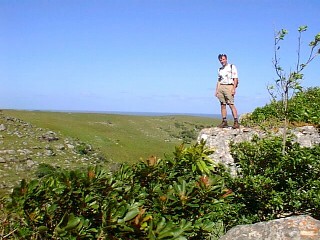 The views were very pleasant indeed but we would have been better off going up there for sundowners. The cows were everywhere and the runway (hopefully disused) covered in pats. Back down the mountain we intended to visit 2nd beach but the local touts/beggars were out in force so we decided to continue on to 3rd beach which is within the grounds of the Silaka Nature Reserve. The 5 rand (50p) each entrance fee is enough to keep away unwanted attention. There are only blue wildebeest, zebra and monkey in the reserve but they were very close indeed - much more so than in any of the other parks. What a treat. The beach was lovely and we spent a while playing with the wriggly things in the rock pools and, of course, chasing crabs. That night I had the first proper sized meal in almost two weeks - a fabulous pepper steak cooked on the braai in the rain. At last, I was on the mend. The following morning we decided that it was time to move on. We had been at Cremorne for a week and felt sufficiently better to hit the road again. However we were greeted with a storm which fortunately subsided after a couple of hours. You can be stranded at this place for days after heavy rainfall because you have to cross a river to get out. In 18 hours the river level had raised by four feet so that the bridge was submerged and the water level up to the top of the tyres. We did contemplate staying longer so that we could wade up to bonnet height and test the snorkel. Steve, the owner of Cremorne, suggested we visit a town called Rhodes in the highlands so we made our way in that direction passing beautiful rolling hills dotted with round mud huts painted pastel pink and loo block blue - disgusting. We had wondered why the houses were on the tops of the hills but after seeing the huge post-rain canyons that had developed along the lower lying areas we knew why. The mountainous roads to Rhodes were lovely but the air temperature turned very chilly indeed. We were surprised to read the thermometer - it said 25°C. Ah - how could we ever go back to the UK and suffer a 20 or 30 degree drop! Arriving in Rhodes (renamed in 1900 after Cecil Rhodes) was like entering a James Herriot set. It was like stepping back 100 years - which it should be as that is how it is designed to be following a great deal of recent refurbishment. Colonial settlers arrived here at the time of the Boer War and created a town resembling old England. Olde Worlde signs pointed us in the right direction. The town is set amongst Yorkshire-type dales has a grand total of 27 residents who all meet up at the local hotel for beers. Everybody knows everybody else's business and they all look out for each other which is delightful. The hotel, pub and shop are all owned by Dirk and Mari who made us very welcome and invited us over for tea the following morning. The campsite is basic but adequate and cheap (at 35 rands a night). The night time temperature dropped though and we were glad of a really thick duvet (thanks for the recommendation Richard & Jo). Once the initial frost had lifted in the morning a beautiful blue crisp day lay ahead. We had tea and delicious melk tart (S. African favourite) with Mari before taking the fun and very very steep drive up to Tiffendel - the local ski resort. Phew - the jumpers went on along with the fleeces as we arrived at 2700 metres. Coffee and yet more cake awaited which we burned off on a short hike up to the peak of Ben MacDhui at 3001m (Eastern Capes highest point). 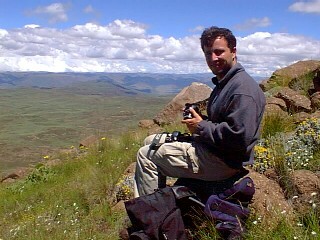 The views were stunning and you could see over into Lesotho which was to be our next country. By the time we had descended from our hike it was lunch time and considerably warmer. Perhaps we had got used to the temperature. 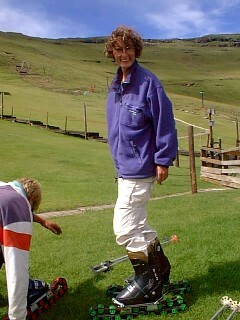 Skiing in Tiffendel is possible for around 100 days per year in the winter but as this was summer we decided to have a go at grass skiing. The fact that this is really a beginner resort was in our favour as we donned the grass skis and headed off to the nursery slopes. 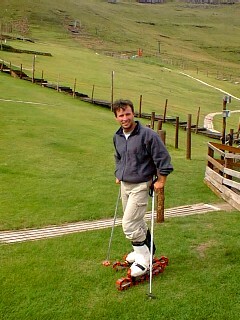 Snow and grass skiing couldn't be more different. You can't turn on the things and suddenly a green run felt like a black one as you hurtled down the slope believing that falling down would be the safest way to stop. After an hour or so we got the hang of it. The drag lift was one you hold onto with your hands rather than the usual type which you sit on. The arms ended up hurting more than the legs. What a laugh though. The drive back was interesting too with some quite hairy inclines downwards. This is Punda territory though and she loved it. After a few drinks in the bar we were invited to have dinner with David and his family and his very farty dogs! Thanks for a very enjoyable evening, David. The night was cold again but the absence of cloud revealed the clearest of skies. The stars were incredible and the milky way was awesome - it cut the sky from the horizon in front of us, passing directly overhead and landing on the horizon behind. You just do not see sights like this in England and we longed for a telescope. After a freezing cold night we drove the 200 km or so to Aliwal North which is home to hot springs. A complete contrast to the chill of Rhodes. The campsite is within the spa complex so we were able to set up camp, stick on the swimmers and head off to the pools with no inconvenience whatsoever. The water was beautiful but what a stink! The bottom of the pool is dotted with vents which every so often emit a gas of some sort. I was convinced it is sulphur. Wallowing in the hot spring was lovely but once we'd reached the very wrinkly state we swapped the pool for a bit of sunbathing and a braai. Cooking on a fire is so easy and if you burn the dinner you have an excuse - it is cooked on an open fire so you expect there to be a degree of charcoal surrounding your food. On Monday 31st we were up early excited about going to Lesotho, which we had read and heard so much about. After a bacon butty breakfast we hid the canned booze in the cupboards and decanted the gin into a tonic bottle as Lesotho does not allow alcohol imports from S. Africa. The awesome Drakensberg 1 gallon of petrol later - the braai master James strikes Jacs takes on a raging torrent Walking/hobbling in Mkambati "Shower anyone ?" Cremorne sanatorium in Port St Johns "When you said you'd take me to heaven and back..." "Put it awayyy" - can't help getting it out The poles look a little bit like crutches - "Excuse me, but is this dangerous ?" "I'm only doing this for the apres ski"